The greatest player of all time can’t be losing a match like this. Not in his prime. Not at Wimbledon. And certainly not twice in a row there. He lost to a journeyman Monday in the first round of Wimbledon. 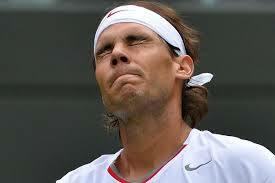 Nadal lost to Steve Darcis, 7-6, 7-6, 6-4. That’s right, the Steve Darcis, ranked No. 135 and with a losing career tour record. The question is why this happened to Nadal, against a guy who had less of a shot at beating him than Buster Douglas had of knocking out Mike Tyson. And what does this mean to his legacy? And how much limping is he going to do in the future? This entry was posted on Monday, June 24th, 2013 at 6:16 pm	and tagged with Rafael Nadal, Steve Darcis, Wimbledon and posted in Rafael Nadal, Wimbledon. You can follow any responses to this entry through the RSS 2.0 feed.